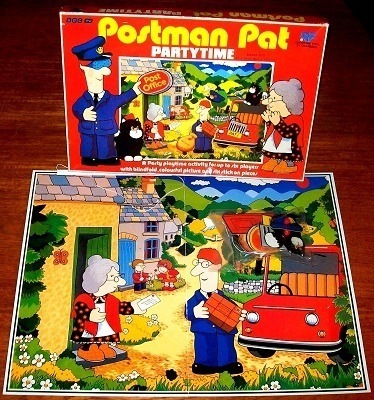 'Postman Pat: Party Time' Game: A party playtime activity for up to six players with blindfolds, colourful pictures and six stick-on pieces. This delightful party game is in excellent and complete condition. The box is in very good condition and each corner remains firmly intact without any use of sellotape. The playing pieces and blindfold to barely used - if used at all.